Lisa Pedolsky and Craig Erickson collaborated on this wood, steel and ceramic table for KDUR’s Furniture As Art auction. 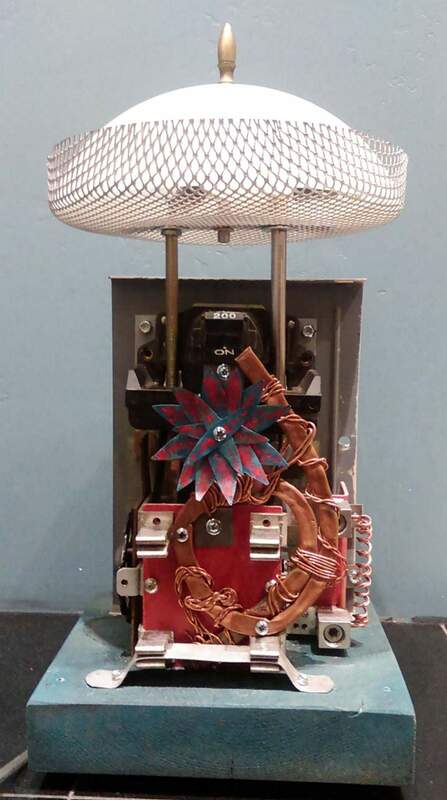 “Passion Flower” by Eric Way is a lamp made of repurposed materials. It will be auctioned off during Furniture As Art. Marie Rolfing has created “A Break Up With Your Phone Stand” for this year’s KDUR’s Furniture As Art auction. 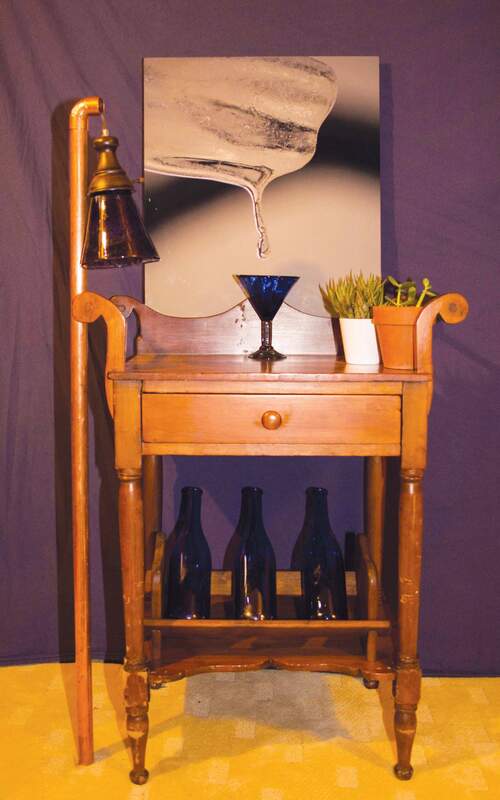 It is a reclaimed bedstand that features a copper lamp with a blown-glass shade. Buying furniture can be a chore – except when it’s KDUR’s Furniture As Art Auction. The annual event, which as been held for at least the last 15 years, is one of Fort Lewis College radio station’s biggest fundraisers. Last year, the station raised about $12,000, said Station Manager Bryant Liggett. The auction will be held Thursday at Durango Arts Center. Your ticket allows you to bid on furniture and also includes live music by Jeff Solon, appetizers and dessert by Chuck Norton, and three free drinks. The Durango Herald talked to a few of the artists participating this year; some have been involved since the beginning, and for others, it is their first auction. Lisa Pedolsky and Craig EricksonCeramic artist Pedolsky and fine furniture and cabinet-maker Erickson have teamed up for their third contribution to the auction – a 24-square-inch table worked in mahogany with a welded-steel frame that features embedded ceramic components. 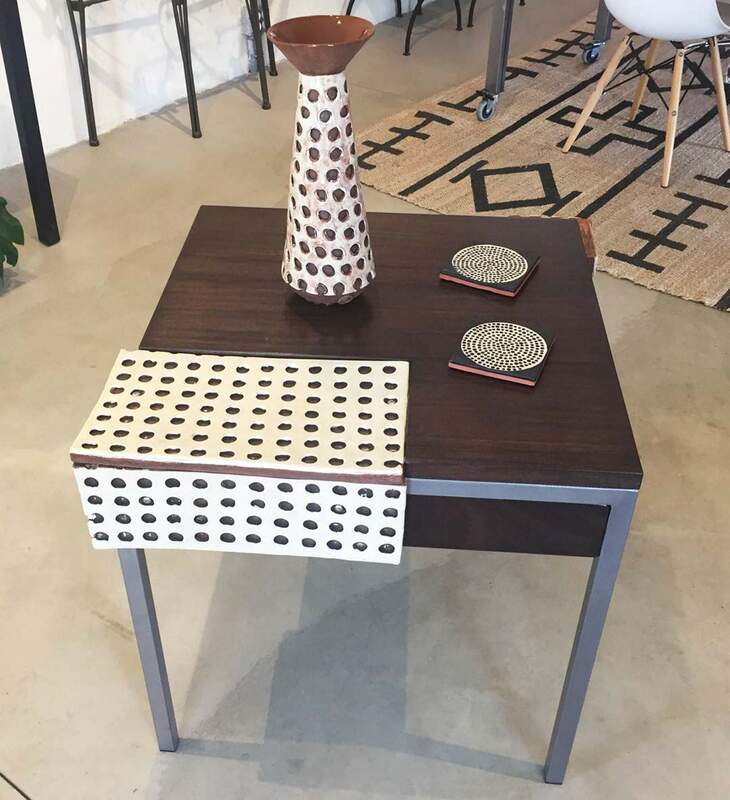 In addition, the table comes with a ceramic vase and two tiles to use as coasters. Erickson said the idea to embed the ceramic pieces in the table came when platters Pedolsky made “met their demise in the kiln.” So the two repurposed them for the project. Pedolsky, who is headed into her 13th year as a contributor to Furniture As Art, said she and Erickson make a good team. Tom KippKipp, a tattoo artist by trade, creates types of art beyond skin. He is also a volunteer DJ at KDUR with a weekly show, “Hoot,” which airs Wednesday nights. This is his 10th year participating in the auction. This year, he collaborated with his friend Zach Counter to make a short bench. Kipp made the wooden seat, and Counter, who works with metal, built the base. Kipp said because the piece is made of recycled materials, the biggest challenge they faced was pulling old screws and nails from the chunk of wood to prepare it for sanding. Marie RolfingRolfing, who will participate in the auction for the second time, pulls other people into making her art. After staring at it for a week, Rolfing knew what the piece would become. Amy FelkerFelker has participated in the auction almost since the beginning. In the past couple of years, Felker has found pieces at the Habitat for Humanity ReStore. Andy OlsonOlson, who went to Fort Lewis College and was a DJ at KDUR, will submit a lantern for his first auction. The lantern is made of paper and birch wood and has an LED bulb on the inside. Olson said contributing to the auction is a way to give back to the station, and a way to get his artwork seen by the larger community. Eric WayFor his fourth year in the auction, Way created a lamp from reclaimed materials. “I’m an electrician and a carpenter, so I deal with a lot of remodel work. It’s all recycled materials out of an old house. I call it ‘post-industrial assemblage,’” he said, adding that the piece took about 20 hours to make. What: KDUR’s Furniture As Art Auction. Tickets: $30. Available at Maria’s Bookshop, 960 Main Ave., and at KDUR, Fort Lewis College, 1000 Rim Drive. More information: Visit www.kdur.org or call 247-7628. Note: This year’s featured artists are: Mike Brieger, Shannon Cruise, Amy Felker, John Ford, Jeremy Gable, Philip Graveson, ​Tom Hahl, McCarson Leigh, ​Janet Kenna, ​Tom Kipp & Zach Counter, Counter Kulture, ​Noah Leggett & Tori Baca, ​Maureen May & Blake Crouch, Monica McManus​ & Jared Reed, Andy Olson, Lisa Pedolsky & Craig Erickson, Marie Rolfing, Bryan & Bella Saren and Eric Way.